Chop up kale or romaine, I used about 2 cups. Chop Scallions about ½ cup. Grab you 1 cup arugula. Throw in your bowl and toss together. If you choose to add tomatoes, slice them in half and place around the rim on the bowl (use desired amount). Then sprinkle some goat cheese on top (desired amount). And Viola, Your Triple Green Salad! Enjoy with any vinaigrette, I especially like this Lemon vinaigrette with it. To make Lemon vinaigrette combined the juice of 1 Lemon, 1 Avocado, 1 TBSP Apple cider or Red Wine Vinegar, 1 tsp raw honey, 1 clove minced garlic and a pinch of cayenne pepper. mix together and pour desired amount over salad. 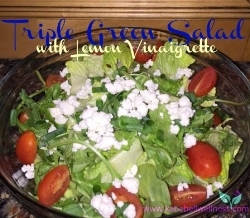 This is one of my favorites and the lemon vinaigrette is great with any salad! Enjoy your Healthy! PS. What's your favorite green Veggie?